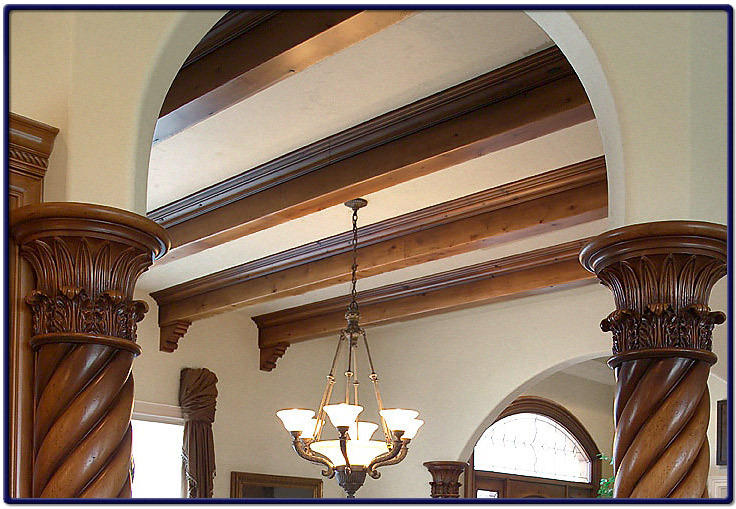 At the center of the picture below are ceiling beams (rich in color) with a satin finish. The beams are traversed evenly across, adding depth to the room. On either side of the image are large swirled wood pillars with intricate designs at the top. A lighting fixture hangs form the top of the high ceiling. The beams can be customized to any shape, color and type of wood. The home was built by Corey Schoenauer of One World Builders near Sun Valley / Twin Falls.